FLAGSTAFF, Ariz.--(BUSINESS WIRE)--Northern Arizona University (NAU) and American Campus Communities (NYSE: ACC), the nation’s largest owner, manager and developer of high-quality student housing communities, celebrated the addition of Skyview to the NAU campus at a grand opening event in Flagstaff, Arizona. The development of Skyview responds to Northern Arizona University’s need to increase their offering of modern, purpose-built, on-campus student housing. Skyview supports the University’s growth by providing these students with high-quality accommodations in a live-learn community that is designed with today’s students in mind. Sited strategically to offer breathtaking views of Mount Elden, Skyview features spacious apartment and townhome-style accommodations, academic resources including an Academic Success Center with iMacs, free printing, and group and private study lounges, and state-of-the-art amenities to promote wellness and resident socialization, including a fitness center with strength equipment, free weights, and separate cardio room, and recreation center with billiards, ping pong and arcade games. The landscape is designed to create a walkable mountain community that accommodates native plantings. Skyview also provides residents with nearly 3,000 square feet of retail space featuring EAT Market. 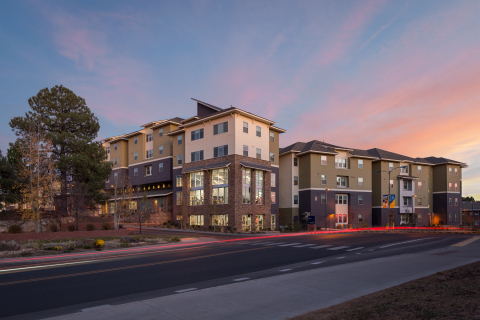 The 626-bed community is the second phase of the Hilltop Townhomes community delivered in 2012, and the fourth phase in the NAU-ACC partnership, which has delivered more than 2,000 modern, on-campus student beds. 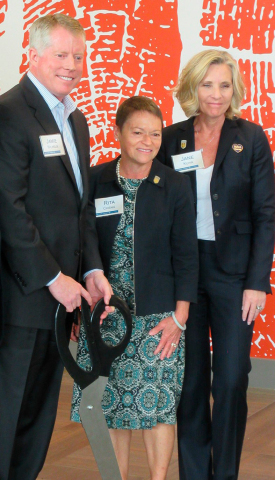 The grand opening event was held at Skyview and featured a ribbon cutting ceremony and reception. Attendees included University representatives, Flagstaff elected officials, and development team members from American Campus Communities. American Campus Communities, Inc. is the largest owner, manager and developer of high-quality student housing communities in the United States. The company is a fully integrated, self-managed and self-administered equity real estate investment trust (REIT) with expertise in the design, finance, development, construction management and operational management of student housing properties. As of September 30, 2017, American Campus Communities owned 166 student housing properties containing approximately 102,500 beds. Including its owned and third-party managed properties, ACC's total managed portfolio consisted of 204 properties with approximately 131,300 beds. Visit www.americancampus.com. Northern Arizona University is a high-research university with a statewide enrollment of 30,000 students. More than 20,000 students attend the Flagstaff campus, with more than 8,000 students enrolled online and at Extended Campus sites statewide. Research in genetics, forestry and ecology has drawn international recognition to the university, which also is highly regarded for its education, business and engineering programs. NAU represents 127 tribal nations and is on its way to becoming the nation’s leading university serving Native American/Alaskan and Hawaiian Native cultures. NAU launched competency-based Personalized Learning in 2013, the first self-paced, online education program that cuts the cost and time to an undergraduate degree. For more information, visit nau.edu. Follow NAU on Facebook, LinkedIn, Instagram and Twitter. In addition to historical information, this press release contains forward-looking statements under the applicable federal securities law. These statements are based on management’s current expectations and assumptions regarding markets in which American Campus Communities, Inc. (the “Company”) operates, operational strategies, anticipated events and trends, the economy, and other future conditions. Forward-looking statements are not guarantees of future performance and involve certain risks and uncertainties, which are difficult to predict. For discussions of some risks and uncertainties that could cause actual results to differ materially from those expressed or implied by the forward-looking statements, please refer to our filings with the Securities and Exchange Commission, including our Annual Report on Form 10-K for the year ended December 31, 2016 under the heading “Risk Factors” and under the heading “Business - Forward-looking Statements” and subsequent quarterly reports on Form 10-Q. We undertake no obligation to publicly update any forward-looking statements, including our expected 2017 operating results, whether as a result of new information, future events, or otherwise.